Break long paragraphs into short 1-2 sentence paragraphs to keep ideas simple and easier to read. Emails are usually written this way for clarity and so can your website content. Scanners often read the top line of each paragraph to gauge whether or not the topic is useful to them before reading the rest. 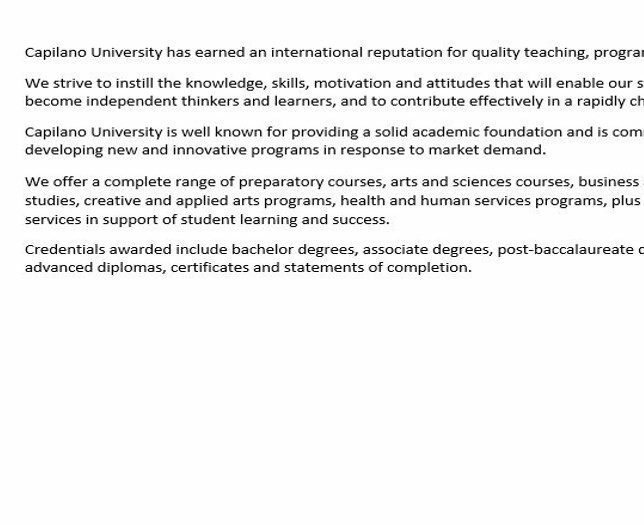 Capilano University has earned an international reputation for quality teaching, programs and services. We strive to instill the knowledge, skills, motivation and attitudes that will enable our students to become independent thinkers and learners, and to contribute effectively in a rapidly changing world. Capilano University is well known for providing a solid academic foundation and is committed to developing new and innovative programs in response to market demand. We offer a complete range of preparatory courses, arts and sciences courses, business and management studies, creative and applied arts programs, health and human services programs, plus a range of services in support of student learning and success. Credentials awarded include bachelor degrees, associate degrees, post-baccalaureate diplomas, advanced diplomas, certificates and statements of completion.